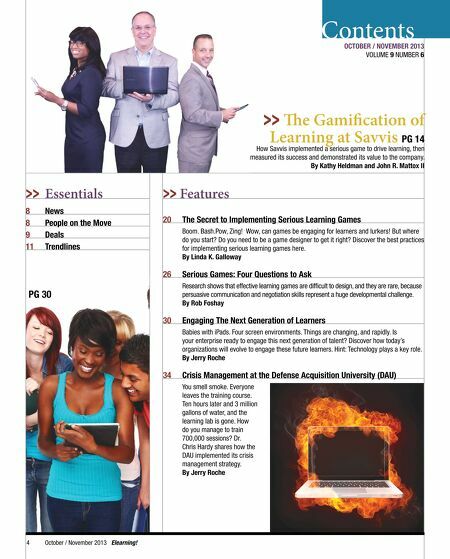 Contents OCTOBER / NOVEMBER 2013 VOLUME 9 NUMBER 6 >> Te Gamifcation of Learning at Savvis PG 14 How Savvis implemented a serious game to drive learning, then measured its success and demonstrated its value to the company. 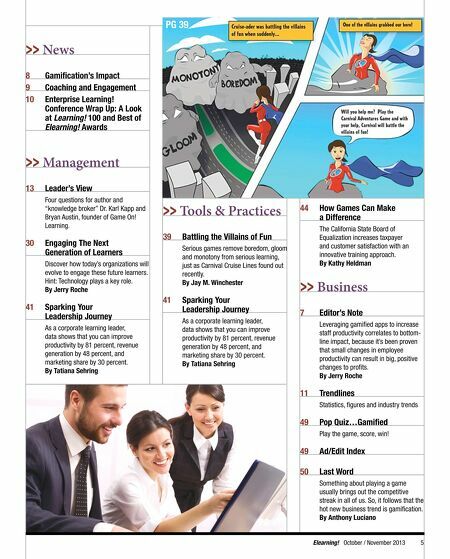 By Kathy Heldman and John R. Mattox II >> Essentials 8 8 9 11 News People on the Move Deals Trendlines >> Features 20 The Secret to Implementing Serious Learning Games Boom. Bash.Pow, Zing! Wow, can games be engaging for learners and lurkers! But where do you start? Do you need to be a game designer to get it right? Discover the best practices for implementing serious learning games here. By Linda K. Galloway 26 Serious Games: Four Questions to Ask Research shows that effective learning games are diffcult to design, and they are rare, because persuasive communication and negotiation skills represent a huge developmental challenge. By Rob Foshay PG 30 30 Engaging The Next Generation of Learners Babies with iPads. Four screen environments. Things are changing, and rapidly. Is your enterprise ready to engage this next generation of talent? Discover how today's organizations will evolve to engage these future learners. Hint: Technology plays a key role. By Jerry Roche 34 Crisis Management at the Defense Acquisition University (DAU) You smell smoke. Everyone leaves the training course. Ten hours later and 3 million gallons of water, and the learning lab is gone. How do you manage to train 700,000 sessions? Dr. Chris Hardy shares how the DAU implemented its crisis management strategy. By Jerry Roche 4 October / November 2013 Elearning!